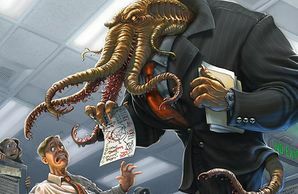 The Bosstradamus (Summus vates) is a boss-monster that once managed workers in a cubical farm. Legend has it that his employees were fed up with his terrible micromanaging, absurd memo formats, and boring team-building exercises that they revolted by using his body to unjam the copy machine. Five hours and three Xerox technicians later, his body emerged from the copy machine a mangled mess in the form of a monster. Well, a scarier looking monster at least. Through the copy machine ordeal, the Bosstradamus gained psychic powers. He used his future telling power to quell the worker uprising and reassert his managerial position. He then used his psychic abilities to predict when people needed to work on a Saturday, but didn't tell any of the employees until 4:59 pm on the prior Friday. Sometimes, he'd even wait until early Saturday morning to call his employees back into the office. On the fifth time he used his psychic abilities to predict the exact second when a worker was viewing the latest NSFW pictures of local celebrity (and walk behind that employee's back), the employees again revolted and banished the Bosstradamus to the dungeons, forever. This page was last edited on 20 January 2019, at 15:52.